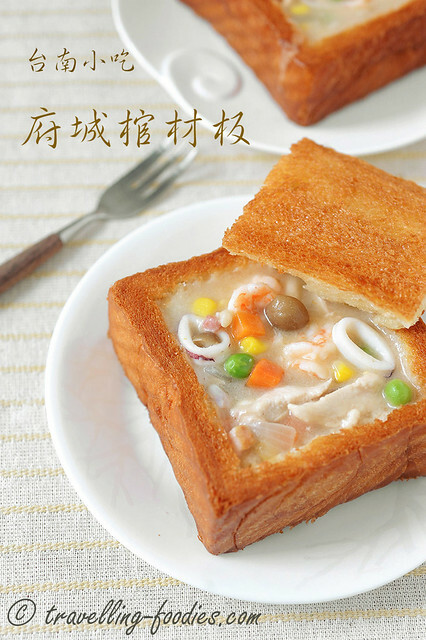 Compared to the other snacks and dishes which originated from Tainan, Coffin Toast Bread came relatively late. It was invented by a Mr Hsu who first brought this dish into realisation in the 1940s in a market called 沙卡里巴 “Shakaliba” phonetically translated its Japanese name 盛り場, to mean “amusement centre“ as this place is popularly known to the locals to be filled with food, leisure and entertainment. Because of its shape, it was named 棺材板 Gua Cai Ban or gwa tsah pang which literally meant “coffin board” in the Taiwanese colloquial tongue, a probable marketing gimmick which proved to be very successful as the dish became extremely popular and soon spread to other parts in Taiwan, especially in night markets. Some folks did try to change the name to “官财板” which is homophonic in script to the original name but expresses a much more auspicious meaning to “升官发财” instead. Unfortunately, the old name seemed to have been quite well ingrained and stuck to the minds of the locals. So it didn’t take long before most vendors selling this snack reverted back to using “棺材板” instead. 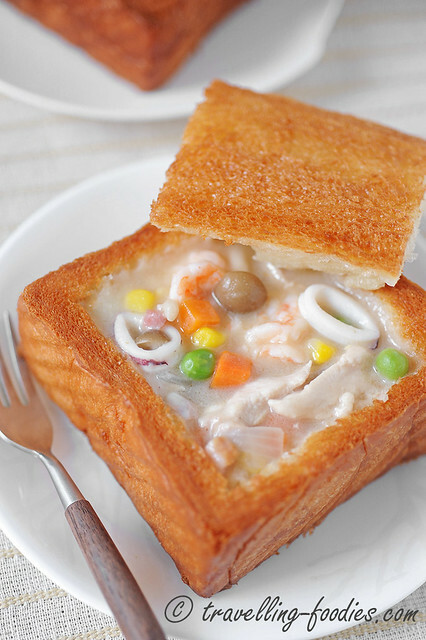 In retrospect most would agree that Coffin Bread Toast is actually a spinoff of a starchy chowder served in a bread bowl, unlike those found typically in Western cuisine. Instead of individual round bread loaves, thick slices of loaf bread aka “Pain de Mie” which was baked in a Pullman tin was used instead. A good and workable recipe for the Pain de Mie can be found here. It is a recipe by an established Taiwanese cookbook author, Carol Hu and the results are highly reproducible. It is better however, to have the bread loaf baked and sliced a day before making Coffin Bread. Strange it may sound, slightly “stale” one or two day-old breads work better than freshly baked ones before as they are drier and thus easier to achieve the crusty and crisp skin without soaking in too much oil in the deep frying process. The whole loaf has to be sliced to form thick slabs which are about 2.5 or 3 times the thickness of regular loaf bread slice to help ensure sufficient “depth” to hold a more substantial amount of chowder filling. I would have imagine the concept to work as well with the bread been toasted as a healthier alternative, instead of of being deep-fried. However, one may wish to note that the toasted bread, though aromatic on its own is distinctively different from one would expect from deep-frying. So I think it is better to stick to the traditional way of making coffin bread toast. The filling has also changed significantly over the years. The original “alpha” version by the late Mr Hsu actually incorporated a large amount of chicken gizzards, especially liver, hence lending the name 雞肝板. 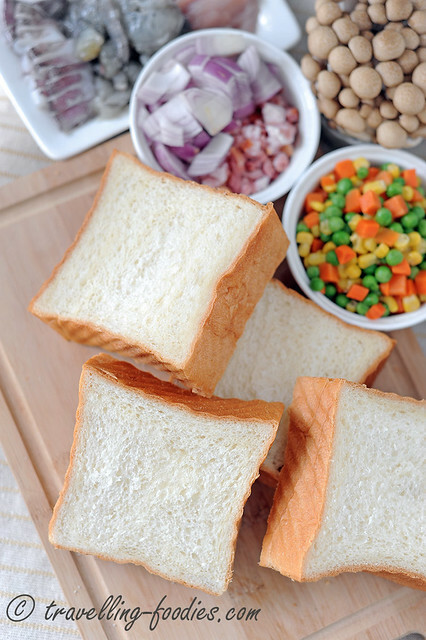 The name “Coffin Bread” was suggested to Hsu by an academic from a nearby institution which later became the National Cheng Kung University, who frequented Hsu’s stall at Shakaliba. The name has been used ever since. The subsequent “beta” versions became more varied, first with seafood like shrimp and squid in place of chicken liver. 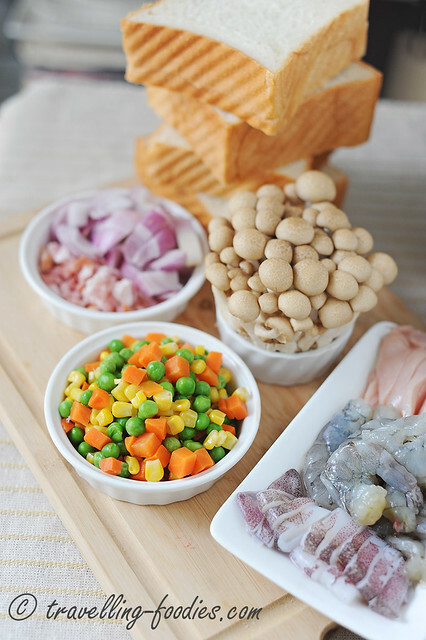 Mushrooms were later incorporated and a large variety has been used, from the canned button mushrooms, and later to fresh button or brown mushrooms and most recently, shimeji mushrooms as well. Frozen mixed vege in the form of diced carrots, corn kernel and green peas seem to have been “evergreens” to Coffin Bread Toast over the ages, largely attributed by their vibrant colours which make the dish all the more visually appetising presumably. Otherwise, the meat component can vary from the usual shredded chicken, pork to cured ham, bacon bits and even canned tuna. Some more innovative fellas created thematic Coffin Breads like a “Hawaiian” version which incorporated ham, onions and canned pineapple! Speaking of pineapple, some other hawkers peddling Coffin Bread has sweet versions available on their menu which uses a plethora of mixed fruits, from fresh bananas, mango or strawberry when they are in season to canned peaches. While the traditionalists and purists would stick to the more typical versions, the fruits and other mind-blowing combinations seem to be quite popular amongst the younger and more adventurous crowd. Care needs to be taken to ensure the bread doesn’t burn or brown too much from the deep-frying. That said, high heat is still required to make sure that the surface crisps up amply while preventing any oil from seeping into the toast. The first side require less than 20 seconds to brown nicely while the other side even lesser. So some dexterity is needed here. 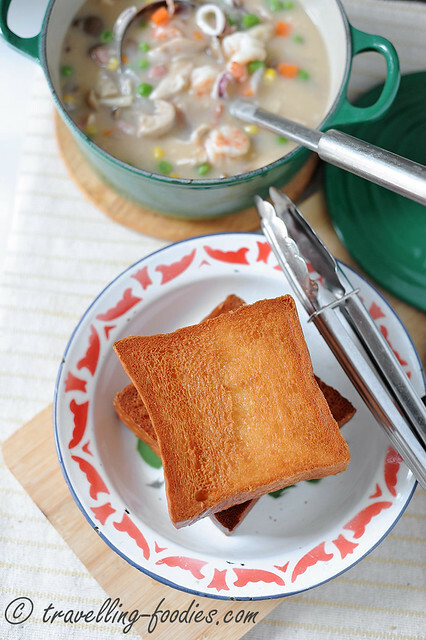 The chowder filling uses a Béchamel sauce (白酱) as the base which involves making a roux with melted butter and flour, before the addition of milk or cream. In the traditional Tainan Coffin Bread Toast, milk powder and water is used instead of fresh milk as the former is much more fragrant (奶香味). Full-fat cream was never used in the commercially available Coffin Bread, understandably as the cost would have been to high. But I would think that it is a highly plausible substitute for milk powder and water concoction, especially when one may not have regular or sufficient use for milk powder at home apart from making these simplified Bechamel sauce with it! That said, it is not strictly a Bechamel sauce as well since water is also added in the form of a bouillon stock. 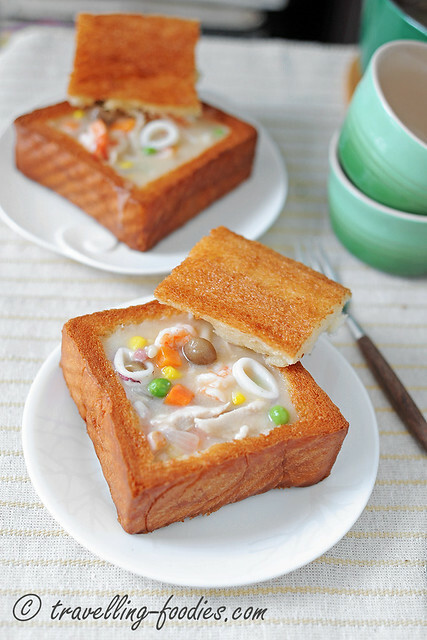 With the chowder cooked and the bread toast deep fried, all that’s left is to assemble the two components together for a truely authentic tasting of this popular Tainan snack, Coffin Bread! Bouillon stock (either pork or chicken), made by dissolving 1 stock cube in 2 1/2 cups of tepid water. Equivalent amount of chicken powder (preferably without MSG) may also be used. 2 medium squid, body only rinsed and sliced into rings, marinated with a small pinch of salt. 10-12 medium prawns,head and shell removed, and deveined, marinated with a small pinch of salt. 1 cup of frozen mixed vegetables, i.e. diced carrots, peas and corn kernels, thawed, rinsed and drained. 1 head of shimeiji mushrooms, broken into pieces and rinsed. Sliced brown mushrooms may also be used. To prepare bread toast, first fill a wok with sufficient wok to sit at least half the height of the bread toast. At medium-high heat, deep fry one side of the bread toast until it is lightly brown. Flip carefully onto the other side deep fry until lightly brown as well. Flip back to first side for a couple more seconds until toast is golden brown. Repeat for the other side. Drain and set aside to cool down slightly. Be careful to keep a watchful eye over the toast at all times throughout the whole process as the browning occurs very rapidly. Please make sure that the oil is sufficiently hot before adding the toast or the bread would end up soaking up some of the oil. To prevent the latter from happening, it is also better to use bread which is at least 1 day old as described above. While waiting for the bread to cool, prepare the filling. Saute chicken slices quickly over a saucepan on medium-high heat until the exterior turns pale. Add prawns and squid rings and saute quickly until the prawns are just cooked. Transfer to a plate and set aside. Saute mushrooms slightly until aromatic and set aside. To prepare a Bechamel sauce, first make a roux by melting butter over a heated work at medium-low flame. Saute the diced onions quickly until they turned translucent and aromatic. Do not raise the temperature too high or the milk solids in the butter may brown. Add flour and stir fry slightly to form a clumpy mess and until it is fragrant. Add bouillon stock, followed by full-fat cream or milk powder-water concoction, and quickly stir to amalgamate the roux into the stock to form a sauce. 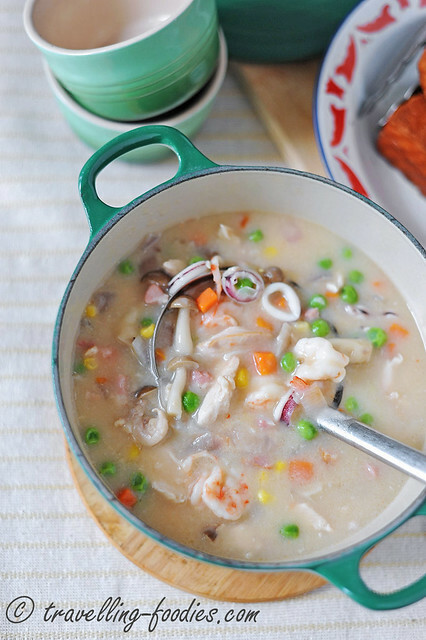 Return sauteed meat, seafood, mushrooms, as well as frozen vegetable to the sauce and continue to stir until thickened. Add sugar and adjust the taste with more salt if necessary. Adjust the consistency with more starch-water concoction if necessary. Set aside to cool down slightly. To assemble, first make parallel slits with a small/paring knife around perimeter of the fried toast, about 5mm away from the brim to form a “square cover”. Be careful not to cut through. Carefully remove the cut out square cover by sliding the knife below the cover and run parallel to it. Using a spoon, flatten the bread texture within the cavity to create more room for the chowder filling. Ladle sufficient chowder filling into the dug out cavity. Serve immediately with another cracking of fresh pepper over the top. 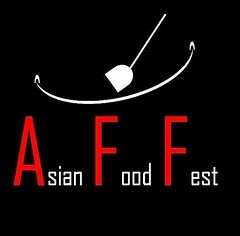 This entry was posted on August 12, 2014 by Alan (travellingfoodies). It was filed under Food, Simple Eats, Travel and was tagged with bread loaf, Tainan Coffin Toast, Taipei, Taiwan, 台南, 台湾, 府城, 棺材板. That is some complex bread! We had this at Anping. Not too bad. Now with your recipe, I can prepare this at home. Thanks.